I can't believe it, my little girl is ONE! We celebrated by having a small, casual, relaxed BBQ with close family, and were so lucky that her actual birthday fell on the Saturday of our recent long weekend. Lots of special milestones closely followed - her first real paddle at the beach, a ride in her Papa's boat at the river, her second tooth! And we're almost at the stage where 'stepping' turns into 'walking'. 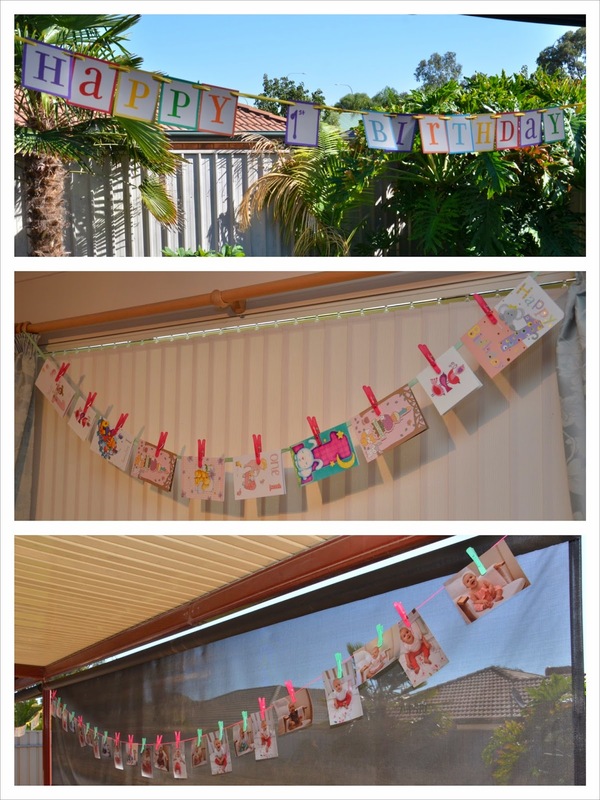 I love banners and the 'clothesline' look for photos & cards. We hung the "Happy 1st Birthday" banner between two posts (click here to visit the Etsy shop I got it from) and did the same with her birthday cards inside. We also showed off her 'monthly photos' (here's a separate post I wrote all about Photo a Month). I am a lover of photos and photography. A photo display definitely adds something special to a child's party. But it's also important to think about capturing the day! I found this link useful when considering and planning photos to take of the day. Think about "A day in the life of..." your little one. Photograph them when they wake up, open presents, having meals, eating cake of course, playing with their new toys, photos with various family members and friends, bath, bed etc... We did the typical presents before and after shot! 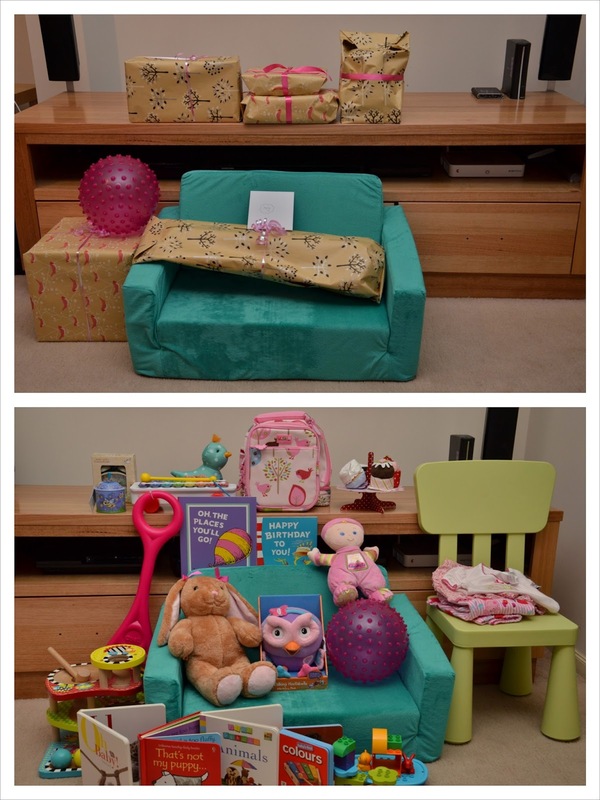 Our little girl was very spoilt with many special gifts on her first birthday. I'm quite often asked for gift ideas and this is regularly a popular topic amongst my Facebook mother's group. 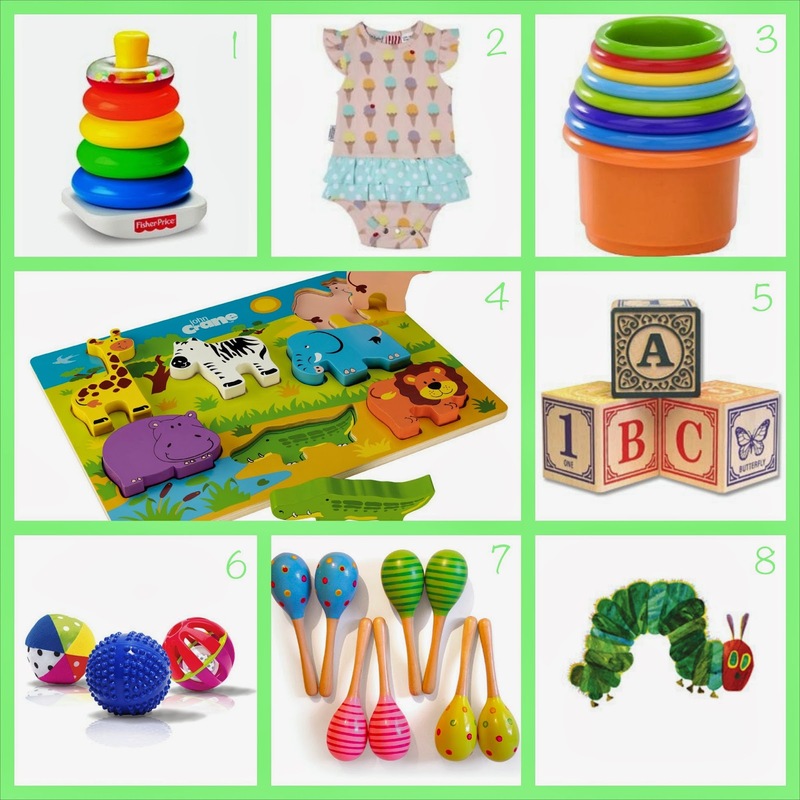 So here's a little list of my top 8 gift suggestions for a one year old (or toddler). 8. Books books and more books! 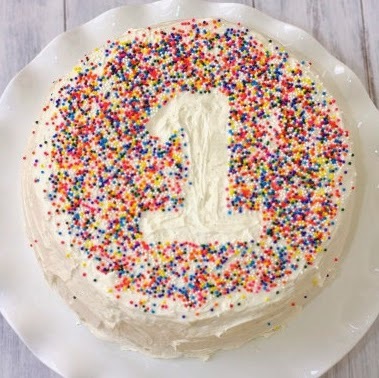 For my little one's party I had composed my own video compilation of her first year (using iMovie on the mac) - our family loved watching it and it'll be something special to show our daughter in years to come. I found iMovie really easy to use! Finally - the cake! It was very simple and made with love by me! Found the idea on...you guessed it - Pinterest. This is not the actual cake I made, just my inspiration from Pinterest - this photograph is much better. Well that's it! Her first year flew by and now her birthday celebrations are done and dusted! I'm really looking forward to planning 'kids' parties for her in years to come! Bogus rolex replica sale will be unlawfully bought that you can buy to get maximum equally as much attractive force as being the primary a person. This is certainly native to the island around Parts of asia just like hublot replica sale. These are typically serious counterfeits with American creator different watches, as they quite simply construct reproductions of vintage designs with creator different watches. If you ever get replica watches sale make sure you take a look at it has the transparent backside instance, who has exceptional benefits together with a reputable custom logo design. A excess fat of your reputable named Rolex is definitely quite more heavy as compared with rolex replica sale. Hence, make sure you take a look at plus symbol a disparities amongst reputable plus bogus different watches in advance of shopping for these folks. Swiss different watches will be above a little really facial area, its implicit style and design joined with technical resourcefulness signify potentially they are prominent global. Nonetheless exactly what is a Swiss look at plus the key reason why will be people hence sought-after. Why is fake breitling sale a strong all-time traveling pet.